To Cite: Saghebi S R, Sharafeh S, Kharabian S, Marashian M, Eshaghi F, et al. The Effectiveness of Mechanical Insufflator/Exsufflator in Sputum Discharge Among Intensive Care Unit Admitted Patients, Arch Crit Care Med. 2017 ; 3(1):e60468. doi: 10.5812/accm.60468. Background: Mechanical insufflator/exsufflator has been introduced in relevant fields during the recent decades and provides intermittent negative and positive pressures to simulate an effective cough in patients. The current study attempted to assess the effectiveness of mechanical insufflator/exsufflator in secretion evacuation from patients’ airways in an ICU setting. Methods: Through a randomized clinical trial study at a university referral center for pulmonary diseases, patients with neuromuscular disorders causing face sputum discharge problems, were recruited. Patients with chest tube and positive cases for human immunodeficiency virus (HIV) in addition to people with predisposing problems, who confounded the study, were excluded. Physical examination and the consequent findings, such as chest auscultation, peak cough flow, the color of sputum, and patient’s general condition were recorded before dividing the participants to two groups of cases and controls. The control group only experienced traditional techniques of physiotherapy, such as respiratory exercises, chest massage and percussion against the other group, who used mechanical insufflator/exsufflator under the brand “Cough Assist ®” in coping mode (SYNC) beside the mentioned traditional methods, available for the controls. Visual analog scale (VAS) was used for the two former items with scores between 0 and 10, considering higher scores for more critical or worse conditions. Results: In total, the 40 cases enrolled in the trial were divided to 20 cases and 20 controls. The mean age ± standard deviation was 32.3 ± 4 years in controls and 31.8 ± 3.4 years in others. The results showed statistically significant differences between the groups. Heart rate, O2 saturation, and Ptcco2 (transcutaneous carbon dioxide tension) were the only parameters, which were not different comparing cases and controls. Chest auscultation and sputum growth had the most improvement in cases. 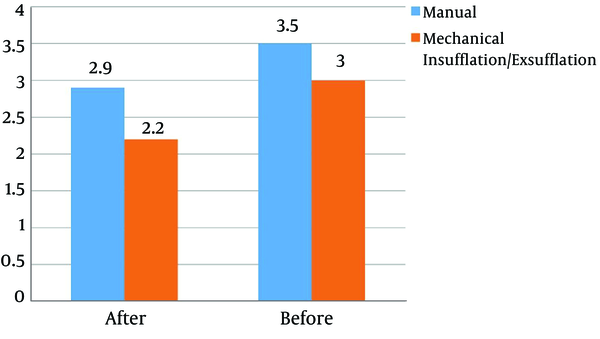 Concerning the peak cough flow, an absolute rise was found in mechanical insufflator/exsufflator when compared with traditional methods (43 cmH2O in cases versus 8 cmH2O in controls). Sputum transparence was the other parameter, which differed absolutely after using the machine in the case group (56% versus 44% in controls). Conclusions: To conclude, MIE deserves greater focus in a wide area to assist patients with impaired cough expectorate and their secretions using a device with no serious complications like barotrauma, pneumothorax, cardiovascular consequences or even postoperative wound dehiscence in relevant surgery cases. Ineffective cough is simply one of the causative factors of morbidity and mortality in individuals with neuromuscular diseases (1). A normal cough needs the person to breath up to 85% to 90% of chest total capacity before fast closure of the gloat in only 0.02 seconds. Opening the gloat beside the contraction of abdominal and intercostal muscles (expiratory muscles) increases pleural pressure up to 190 cmH2O to provide an expiratory flow equal to 360 to 1200 m/s (2-7). The absence of normal effective cough is a common problem in people with weak inhale/exhale muscles, such as neuromuscular genetic disorders, consciousness issues and primary pulmonary conditions, such as bronchiectasis and cystic fibrosis (8, 9). A range of activities are usually employed for effective sputum discharge from special breathing techniques to chest advanced physiotherapy (10-12) while mechanical insufflator/exsufflator has been introduced in relevant fields during the recent decades, and provides intermittent negative and positive pressures to simulate an effective cough in patients. This machine has been assessed by a handful of studies, such as Chatwin’s, which was done on patients with neuromuscular disorders and/or COPD (13-15) whilst the attempts by Kendrick et al. assessed the effectiveness of the device on patients with CF (16). Beck and Barach (1953 to 1954) showed clinical and radiographic improvement in 90% of patients, including cases of respiratory infection, other respiratory problems and neuromuscular or skeletal diseases with no barotrauma or pneumothorax as complications (17-19). Mechanical insufflator/exsufflator provides a positive pressure for breathing with the optimal capacity of lungs before a swift switch to negative pressure in upper respiratory tree in order to mimic a normal cough in patients to clean the airways from secretions. The current study attempted to assess the effectiveness of mechanical insufflator/exsufflator in secretion evacuation from patients’ airways at the ICU, where it is highly vital for individuals to have a clean respiratory tract. Through a randomized clinical trial study at a university referral center for pulmonary diseases, the researchers recruited patients with neuromuscular disorders, consciousness disturbance or any disease, which caused individuals face sputum discharge problems, such as CF, bronchiectasis or suppressed immune system. All the patients were admitted to the ICU based on physician administrations. Patients with chest tube and positive cases for HIV in addition to people with predisposing problems, who confounded the study, were excluded. Physical examination and the consequent findings, such as chest auscultation, peak cough flow, the color of sputum, patient’s general condition as well as chest radiology findings were recorded before dividing participants to two groups of cases and controls. In the control group, patients experienced only traditional techniques of physiotherapy, such as respiratory exercises, chest massage, and percussion against the other group, who used mechanical insufflator/exsufflator under the brand “Cough Assist ®” in coping mode (SYNC) beside the mentioned traditional ways, received by the controls. The study had a single physiotherapist to manage and run all the physiotherapy sessions for both groups and the amount of sputum, difficulty of sputum discharge, color of the sputum, and chest auscultation findings were recorded in each session. The VAS was used for the two former items with scores between 0 and 10, considering higher scores for more critical or worse conditions. Physiotherapy was done for 10 sessions and the results were gathered in special questionnaires before the analysis. Patients in both groups were evaluated for radiographic findings, peak cough flow, and the changes as well as clinical findings before and after the application of the machine, and the data were entered in the relevant software to be analyzed and compared considering CI = 95%, type one error (α = 0.05), and significance (P value = 0.05). Qualitative data used the Chi-square test, and the normality of data was checked by the Kolmogorov-Smirnov test in addition to boxplots. “Repeated Measures Analysis of Variance (ANOVA)” was applied in terms of comparison between quantitative variables in consecutive times. All the tests were done in a two-tailed model. The sample size was calculated as 20 for each group, regarding the above parameters to achieve 0.8 power for the study. In total, 40 individuals were enrolled in the trial and were divided to 20 cases and 20 controls. The mean age ± standard deviation was 32.3 ± 4 years in controls and 31.8 ± 3.4 years in the others. Males made up 75% of patients in each group and regarding Table 1, no significant difference was seen in this regard. Educational degrees and living area were also recorded yet no difference was found. However, 78% and 80% of patients were urban residents in control and case groups, respectively. The COPD was presented at 25% proportion in each group. Table 2 presents a wide spectrum of parameters for both groups, among which seven showed differences statistically between the groups. Heart rate, O2 saturation, and Ptcco2 (transcutaneous carbon dioxide tension) were the only parameters, which were not different comparing cases and controls. This study focused on changes of parameters after 10 sessions of physiotherapy in both groups instead of comparison between the net crude values as seen in Table 2. The difficulty in sputum discharge as well as secretion reduction showed the most pronounced changes in the case group when compared with the values before and after 10 sessions. The parameters with the most improvement in cases were chest auscultation and sputum growth. Figure 1 illustrates the diagram of auscultation change scores, which were lower after 10 sessions along with more decrease in cases (0.8 versus 0.6 in controls). Concerning the peak cough flow, the diagram presented in Figure 2 endorses an absolute rise by mechanical insufflator/exsufflator when compared with traditional methods (43 cmH2O in cases versus 8 cmH2O in controls). Furthermore, Figure 3 revealed similarly very lower secretion rate after 10 sessions in both groups with no significant difference. Sputum transparence was the other parameter, which differed after the use of the machine in the case group (56% versus 44% in controls). aValues are expressed as mean ± SD or %. The current study attempted to assess the effectiveness of a device, which has been used for decades on respiratory expectoration among patients, who were admitted to the ICU. 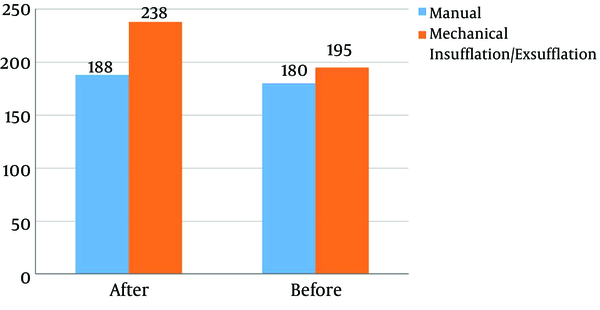 Clinical and radiographic improvements were the outcome measures throughout the current trial. All of the participants in both groups, disregarding their diseases, had problems with sputum discharge due to ineffective cough mechanism and consequently experience respiratory secretion aggregation and stick. Cough assist ® acted perfectly in all users during the study in both clinical and radiographic improvement as separately confirmed by two pulmonologists. Chest auscultation was also improved based on final examinations by separate pulmonologists with wide differences from controls. The difficulty in sputum repulse had the greatest improvement rate in cases against controls and the changes in sputum transparence as well as the peak cough flow showed rather large distance when the two groups were compared. Respiratory muscle strength is physiologically a must for coughing and effective expectoration in humans, and is obviously lost in neuromuscular disorders where pulmonary rehabilitation and airway clearance would be helpful. These contain active and passive types and the mechanical in-exsufflator machine addresses the latter (20). The named machine is one of the primary devices used to support respiratory maintenance and has always been associated with lower morbidities and fewer hospital admissions (1). Another indication of the device is in types of surgery that make physiological cough a challenge due to increased intra-abdominal pressure and wound enhancement, while Miske et al. showed obvious damping in this regard to finally consider the device safe through the postoperative period (21). In 2015, Rafiq et al. published a trial, in which they compared the effectiveness of mechanical in-exsufflator (MIE) versus breath-stacking technique among 40 patients with Amyotrophic Lateral Sclerosis (ALS). They followed up their participants for 12 months or until death to report higher rates of RTI yet lower chance of hospitalization along with lower median survival in the group of mechanical device users. The days of quality of life (QoL) > 75% were much more in the group, who used the breath-stacking technique and the study finally recommended the breath-stacking technique as a low cost first line approach for volume recruitment and cough augmentation in ALS in spite of their low power of study, which is a predominant point of any research by itself (22). This report received some comments about the weak idea the authors raised in this matter. On the other hand, regarding the article that Prevost et al. published in 2015, MIE seems to actually be deprived in terms of clinical usage even in Canada (23) since it is not widely available when asked 114 respiratory therapists of 62 hospitals across the state of Ontario. In addition, they revealed variations of applying the device, which would lead to suboptimal therapy. On average, pressures between 30 and 50 cmH2O suffice for producing assisted cough in adult cases of neuromuscular disorders and this is in the range of pressure, which MIE is able to provide (-/+ 60 cmH2O). This is beside a 0.02-second shifting time from positive to negative pressure by MIE that facilitates a strong cough with no more abdominal pressure than usual. Because of some flexibility to change the applied facemask, MIE is perfectly able to be used in individuals with tracheostomy as well (2). To conclude, MIE deserves to be focused in a wide area to allow surgery patients with impaired cough expectorate and annoying secretions to use a perfect device with no serious complications like barotrauma, pneumothorax, cardiovascular consequences or even postoperative wound dehiscence. 1. Gormley MC. Respiratory management of spinal muscular atrophy type 2. J Neurosci Nurs. 2014;46(6):E33-41. doi: 10.1097/JNN.0000000000000080. [PubMed: 25365058]. 2. Bosch A, Winterholler M. [Technical aspects of mechanical insufflator-exsufflators. Construction and function of the Emerson CoughAssist]. Pneumologie. 2008;62 Suppl 1:S49-54. doi: 10.1055/s-2007-1016441. [PubMed: 18317985]. 3. Leith DE. The development of cough. Am Rev Respir Dis. 1985;131(5):S39-42. doi: 10.1164/arrd.1985.131.S5.S39. [PubMed: 4003907]. 4. Polkey MI, Lyall RA, Green M, Nigel Leigh P, Moxham J. Expiratory muscle function in amyotrophic lateral sclerosis. Am J Respir Crit Care Med. 1998;158(3):734-41. doi: 10.1164/ajrccm.158.3.9710072. [PubMed: 9730998]. 5. Kang SW, Kang YS, Sohn HS, Park JH, Moon JH. Respiratory muscle strength and cough capacity in patients with Duchenne muscular dystrophy. Yonsei Med J. 2006;47(2):184-90. doi: 10.3349/ymj.2006.47.2.184. [PubMed: 16642546]. [PubMed Central: PMC2687626]. 6. Carter GT, Abresch RT, Fowler WJ, Johnson ER, Kilmer DD, McDonald CM. Profiles of neuromuscular diseases. Spinal muscular atrophy. Am J Phys Med Rehabil. 1995;74(5 Suppl):S150-9. [PubMed: 7576422]. 7. Bach JR, Ishikawa Y, Kim H. Prevention of pulmonary morbidity for patients with Duchenne muscular dystrophy. Chest. 1997;112(4):1024-8. [PubMed: 9377912]. 8. Chatwin M, Simonds AK. The addition of mechanical insufflation/exsufflation shortens airway-clearance sessions in neuromuscular patients with chest infection. Respir Care. 2009;54(11):1473-9. [PubMed: 19863831]. 9. Bradley J, Moran F. Physical training for cystic fibrosis. Cochrane Database Syst Rev. 2002;(2). CD002768. doi: 10.1002/14651858.CD002768. [PubMed: 12076449]. 10. Thomas J, Cook DJ, Brooks D. Chest physical therapy management of patients with cystic fibrosis. A meta-analysis. Am J Respir Crit Care Med. 1995;151(3 Pt 1):846-50. doi: 10.1164/ajrccm/151.3_Pt_1.846. [PubMed: 7881681]. 11. Warnock L, Gates A, van der Schans CP. Chest physiotherapy compared to no chest physiotherapy for cystic fibrosis. Cochrane Database Syst Rev. 2013;(9). CD001401. doi: 10.1002/14651858.CD001401.pub2. [PubMed: 24006212]. 12. Bach JR, Niranjan V, Weaver B. Spinal muscular atrophy type 1: A noninvasive respiratory management approach. Chest. 2000;117(4):1100-5. [PubMed: 10767247]. 13. Bach JR, Alba AS. Noninvasive options for ventilatory support of the traumatic high level quadriplegic patient. Chest. 1990;98(3):613-9. [PubMed: 2203616]. 14. Chatwin M. How to use a mechanical insufflator–exsufflator “cough assist machine”. Breathe. 2008;4(4):320-9. 15. Daniels T. Physiotherapeutic management strategies for the treatment of cystic fibrosis in adults. J Multidiscip Healthc. 2010;3:201-12. doi: 10.2147/JMDH.S8878. [PubMed: 21289861]. [PubMed Central: PMC3024890]. 16. Kendrick AH. Airway clearance techniques in cystic fibrosis: physiology, devices and the future. J R Soc Med. 2007;100 Suppl 47:3-23. [PubMed: 17926724]. 17. Bach JR, Sinquee DM, Saporito LR, Botticello AL. Efficacy of mechanical insufflation-exsufflation in extubating unweanable subjects with restrictive pulmonary disorders. Respir Care. 2015;60(4):477-83. doi: 10.4187/respcare.03584. [PubMed: 25492956]. 18. Beck GJ, Barach AL. Value of mechanical aids in the management of a patient with poliomyelitis. Ann Intern Med. 1954;40(6):1081-94. [PubMed: 13159080]. 19. Beck GJ, Graham GC, Barach AL. Effect of physical methods on the mechanics of breathing in poliomyelitis. Ann Intern Med. 1955;43(3):549-66. [PubMed: 13249237]. 20. Neumannova K. [Use of pulmonary rehabilitation in the treatment of decreased respiratory muscle strength]. Cas Lek Cesk. 2015;154(2):72-8. [PubMed: 25994909]. 21. Miske LJ, McDonough JM, Weiner DJ, Panitch HB. Changes in gastric pressure and volume during mechanical in-exsufflation. Pediatr Pulmonol. 2013;48(8):824-9. doi: 10.1002/ppul.22671. [PubMed: 22949331]. 22. Rafiq MK, Bradburn M, Proctor AR, Billings CG, Bianchi S, McDermott CJ, et al. A preliminary randomized trial of the mechanical insufflator-exsufflator versus breath-stacking technique in patients with amyotrophic lateral sclerosis. Amyotroph Lateral Scler Frontotemporal Degener. 2015;16(7-8):448-55. doi: 10.3109/21678421.2015.1051992. [PubMed: 26140500]. 23. Prevost S, Brooks D, Bwititi PT. 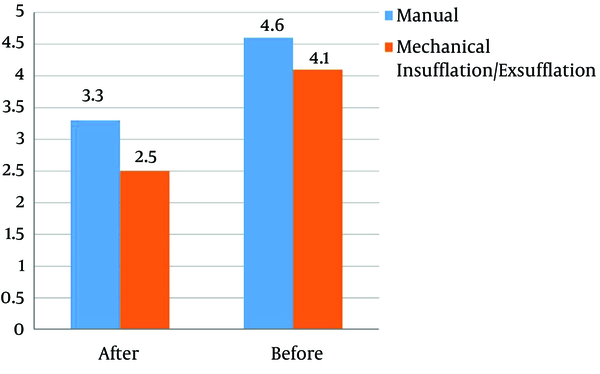 Mechanical insufflation-exsufflation: Practice patterns among respiratory therapists in Ontario. Can J Respir Ther. 2015;51(2):33-8. [PubMed: 26089736]. [PubMed Central: PMC4467476].